Hello everybody! This is Nicole D’Andria, your friendly neighborhood Comic Maven. I am a huge comic book fan and I’ve been writing reviews, news stories and features for over three years at Entertainment Fuse. I’m also the head of their comic book department. I have my own personal website, Comic Maven’s Archives, where I’ve slowly been reprinting all of my work. Almost every site I see focuses on reviewing current comics and neglects older comic books. Some of my favorite series are from decades ago and I feel like I never get a chance to talk about them. 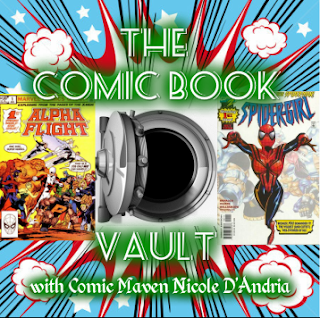 So, I’ll be starting “Comic Book Vault,” a feature where I review old comics. Whether they’re from the 90s, 80s or beyond. I hope you guys enjoy the “Vault,” coming soon to Frontline! Thanks for the opportunity Chris. Awesome intro, I would say welcome to Comic Frontline but you've been a part since the beginning so...welcome to the "front" of Comic Frontline ^_^. Can't wait for the first comic book vault!!! Awesome intro and idea! Thank you for the kind words and all your help! Like Chris said welcome to the Frontline of Comic Frontline! Fantastic intro (I had to resist the urge to follow suit and say "awesome" heh), and I'm looking forward to the feature!